VNC Connect has two capabilities, device access and instant support. Add just the capability you need to your subscription, or both to cover every remote access use case. 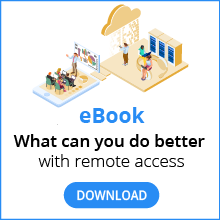 Add device access to your VNC Connect subscription and control computers you own or manage. Install VNC Connect on these computers and enable access at any time, for anyone, attended or unattended, direct or via the cloud. Perfect for remote workers, departmental teams, connecting customers and suppliers, and IT support for your device estate. Add instant support to your VNC Connect subscription and connect to a colleague or customer's computer in seconds with their permission, without installing any software or leaving a footprint behind. Perfect for service desk technicians or IT support in a BYOD environment. You can try both device access and instant support free for 30 days.